Watch as Davison’s Better Way to Invent turns Kay’s Pugz Shoes idea into a store-ready reality! Kay loved taking her two Shelties out for long, wintry trots in the snow. But, with treated roads and sidewalks, her faithful friends would wind up with either cold, wet, snowy or even salt-soaked paws. Kay searched for the perfect pair of paw protectors in stores, but each pair fell short, falling off her pets’ paws and, again, leaving them out in the cold. 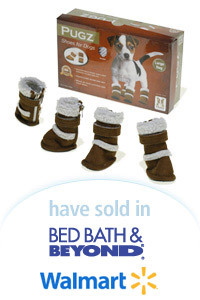 After coming to us for help in designing the product, it was licensed by a company looking for innovative pet products.